These budget-friendly, decorating ideas will help you create a wickedly fun yard or porch for Halloween that won't scare the bejeebers out of your family, neighbors or wallet. Get your front door Halloween ready with this eyeball wreath tutorial by Polka Dot Chair. You'll need a wire wreath frame with chenille ties to make. First, tie bows around the frame using black, mesh ribbon. Next, secure each bow with a chenille tie. Once the wreath is filled out, add a layer of fabric bows in seasonal colors. To complete the look, attach eyeball ornaments. A dozen usually costs less than five dollars at most craft stores. Crafty do-it-yourselfers can make this fantastic Halloween street sign by Birds and Soap using scraps of wood and paint. To get into the spirit, use the names of locations from your favorite horror movies. Are you looking for a spooky idea that's more friendly than scary? This balloon ghost tutorial by Studio DIY is right up your alley. To make these whimsical spirits for your porch or yard, you'll need helium, balloons, tissue paper, and a black marker. Countdown to trick or treat time with this DIY Halloween calendar board by Lolly Jane. The tutorial includes a free template for the lettering. What's holding the numbers? Painted mouse traps! Pumpkin carving is hard. These adorable ghouls by Kristyn Burney ditch the knife for some push in facial features. Create these cute and creepy floating luminaires by Polka Dot Chair using LED glow sticks and cheap witch hats from your local dollar store. To hang, pull fishing line through the top of a hat using a needle and then secure the cord to a removable, adhesive hook made for outdoor use. This unearthly trio by Alanna Wendt to Tennessee was created using tomato cages, wire and string lights. To make the ghostly faces, grab a Sharpie marker. Dress up your stoop with this no-carve pumpkins project by Pretty Providence. The clever do-it-yourselfers behind the site created the pumpkin people using black felt and a glue gun. Afterward, they added a few personal accessories. Greet your trick or treaters with this Halloween inspired scarecrow photographed by Cecile V. The fringed fabric "body" ups the boo factor. Celebrate the Day of the Dead and Halloween too with this colorful sugar skull lantern tutorial by Pear Mama. She used paper lanterns, tissue paper, and Modge Podge to create. Welcome little ghoulies who come knocking with this DIY door monster by Modern Day Moms. The best part, the main ingredients put leftover party supplies (streamers and paper plates) to fun use. This customized pumpkin patch by Cara Carroll features vinyl letters from a DIY lettering kit. Transform any shrub in your yard into a green monster like this one by Ava's Alphabet. To do just add giant googly eyes. You can use disposable dinnerware to make. We love holiday decorating ideas that appeal to both kids and adults. 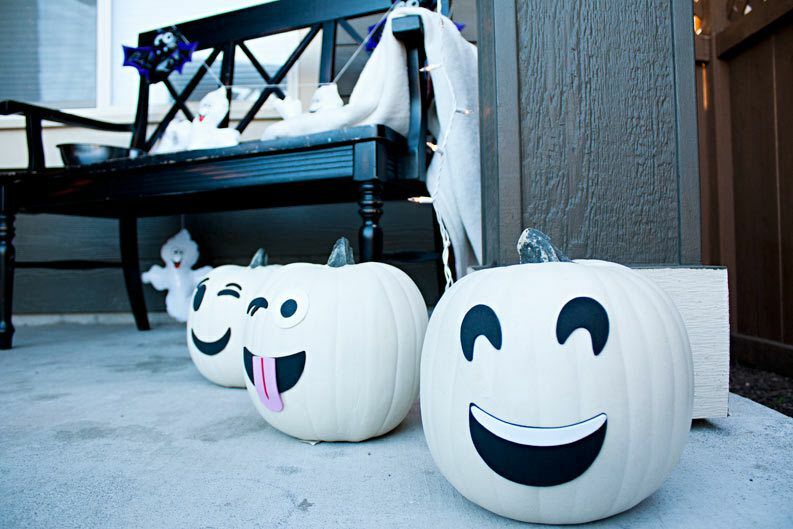 This Halloween porch tutorial by Crazy Wonderful scores big points for being super charming. It features how to make the adorable black cat door hanging using black felt, foam board and embroidery floss. Trick out your yard with this DIY gravestone tutorial by Jen Woodhouse. Because these spooky slabs are free-standing, you won't have to dig up your lawn. All you need is twine, rope and a staple gun to make this giant spiderweb by the duo behind The Cavender Diary. This repurposed wood shutters sign by Organized 31 will let all the trick-or-treaters on your block know you're dishing out candy. If you have a scroll saw you can create these darling monsters featured on All Things Thrifty by cutting 1/2 inch MDF. Frankenstein's lips were drawn using hot black glue. If you're looking to prettify your front door with something chic for Halloween, look no further than this stylish feather wreath by Polka Dot Chair. All of the components including the wreath frame and plumes are available at most craft stores and even better, should total less than $20. Who says Halloween can't be punny? You don't need stellar handwriting for this colorful pumpkin tutorial by Studio DIY. After painting the pumpkins, tattoo paper is used to spell out each pun with the help of a printable. Create a creepily, welcoming porch with this black crow door hanging tutorial by The Happy Housie. The blogger also added a few pieces of spooky décor to the seating area. We love a good craft project, and this dryer vent pumpkin tutorial by Grillo Designs is one of our favorites because while it looks hard to make, it's not. First, connect both ends of the vent to form the shape. Next, paint your new creation. When it's dry, top off with a short branch and moss. Decorate your porch or child's playhouse with this bat and spider DIY by Lay Baby Lay. To make, you'll need wood circles for the bodies (you can buy them at most craft stores), black craft paint, black construction paper, pipe cleaners, mini pom-poms, googly eyes, and glue sticks. To make this whimsical pumpkin topiary by Be Book Bound just stack a couple of pumpkins snowman style in a decorative outdoor planter and add stems of colorful leaves. Afterward, draw the face and buttons. Give the fall harvest arrangement on your front porch a Halloween twist by adding a couple of hand-painted rocks like these by Atta Girl Says. To weatherproof your creations use outdoor craft paint. When it comes to kid friendly Halloween décor, we can't think of anything cuter than these no-carve emoji pumpkins by Making the World Cuter. While the blogger used a DIY kit to get the job done, you'll find several free printables on Pinterest.